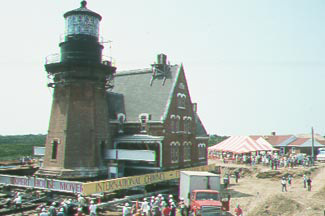 The National Historic Landmark, Southeast Lighthouse(1873) was moved back from the edge of the bluff in 1993, as it was in danger of falling off the Mohegan Bluffs on the southeast side of the island due to extreme and ongoing erosion. An authentic first order Fresnel lens in the tower still sends out a green beam across the ocean. In addition to offering tours of the tower during the summer season, the site offers a great location for weddings or special gatherings. Contact the Southeast Lighthouse Foundation @ 401-466-5009. Special Group Tours can also be arranged via the Historical Society. A unique food truck is located inside the gate this summer selling water, refreshments, lobster rolls and “SE Light Delights”.